I got up at 5:30 AM so I’d have enough time to wash and dry my CPAP equipment since I needed to bring it to the surgery center. I’d packed everything else beforehand in a small rolling carry-on (brace boot, forms, distilled water, hose stand, full face mask [in case I went into “mouth breather” mode], eyeglass case, pen, notepad, etc.). The CPAP case slips right over the telescoping handle of my suitcase. The luggage also gave me a place to stow the inevitable stack of medical papers I got upon arrival, and a place to secure the items I couldn’t take into surgery (phone, watch, wallet, car keys, etc.). We left at 06:25 AM to allow for Atlanta traffic. Our route direction didn’t coincide with the flow of rush hour except for a small section of inbound interstate. Although packed, everything was moving steadily so we arrived in 26 minutes. The facility was like a ghost town and the lobby and halls were eerily empty. Susie wondered if they were even open, but since the entrance was unlocked we made our way to the surgery suite. There we were surprised by a nearly full waiting room. This particular part of the center had been open for quite a while because patients were already being discharged as we entered. As is typical in the medical world, they have you show up an hour ahead to fill out paperwork. But the paperwork only takes a few minutes. So you’re left waiting a long time before your turn. Thankfully, I’m not a nervous person, but I can imagine this would be torture for worry-wart types as it was nearly three hours (09:40 AM) before I went to surgery. After I was called by a nurse and escorted to the back, there was about an hour of prep, consultation, and (of course) more waiting. Prep started with donning on the hospital smock while all but my underwear went into a storage bag. They let wear my eyeglasses until right before heading to the operating room. In the staging area one of the posters is about how often they’ll be asking you “why are you here?” type questions. And they took many precautions to ensure the correct foot was fixed. For example, the “other” foot was in a compression sleeve, then covered with a bright orange sock. While the “correct” foot was bare, having been swabbed in an antiseptic wash (cold!) and the foot and ankle area shaved. Plus the doctor used a Sharpie marker to mark the correct foot after verbally re-confirming. My blood pressure was good, and my resting heart rate was an excellent 49 BPM. At one point my wife was worried that I wasn’t breathing properly when my oxygen levels dropped. The drop eventually triggered an alarm, but the actual issue was the sensor had shifted. After the nurse quickly corrected the alignment things were back to normal. The heated blankets the staff layered on me were much appreciated as it was a cold day and I’d worn only a short-sleeved T-shirt and thin sport shorts per their recommendation. They inserted an IV into the back of my hand. This was the most painful part and the needle felt huge and any time they administered a fluid (antibiotic or anesthesia) it would burn a bit. Later, when the IV was removed and I got a look at the entry wound I was surprised that it was a tiny hole. So, I guess the hand has a higher density of nerves that made it feel worse than such a tiny needle would imply. The other two injection points, for the nerve blocks, were insignificant and easy to ignore. Once they took effect there was absolutely no feeling whatsoever in my foot. And it was very weird to send a mental command to my toes, but they would not wiggle. My foot remained in this state for the rest of the day and night. Also the nerve block continued with only the barest of “pins & needles” that evening, just below the knee. At 09:40 AM they moved my bed into the operating room, and I rolled onto the operating table face down. There were a couple of tube-like pillows to elevate my chest plus a regular pillow for my head. They attached a few probes to by back, started my IV, and gave me a breathing mask. Then I went from fully conscious to totally out in a single blink. Achilles tendon detachment, debridement, reattachment and/or reinforcement with autograph. This is in conjunction with a partial calcaneus excision (extra heel bone cut off) to remove Haglund’s Deformity. Videos (animation [ https://youtu.be/BCvGTmTEZcM ] or actual surgical footage) can be found on YouTube if you search for Arthrex Achilles SpeedBridge. Partial plantar fasciectomy (I’m not certain of the exact procedure actually used, but I did find a YouTube video [ https://youtu.be/71DFCb8eWnk ] of one example method). Consciousness drifted back in the recovery room as the nurse advised me to remain still. But my hip joints ache when supine for too long and they eventually sat me up a bit to alleviate the pain. Susie was there and the nurse said “He’s fidgety” and my wife assured her that it was a normal state for me. My foot was wrapped in an “ace” bandage to the knee and my boot was over that. Black crepe medical tape wrapped my hand to hold gauze in place over the IV entry point, but there was no pain in that area. The doctor had debriefed my wife while I was still under, so she informed me that the operation had been uneventful. The doctor had provided a half-dozen pages of post-op instructions, which she added to my folder. They hadn’t needed my CPAP during recovery, but emphasized that I should definitely use it for sleeping and napping since anesthesia can amplify the frequency and severity of apneas. I never experienced any of the other negative after-effects of anesthesia, not even drowsiness. Within a few minutes of awakening, I was taken by wheelchair to our nearby vehicle and I transferred to the passenger seat (at 11:40 AM). Since I’d been prohibited from eating or even drinking water after the previous midnight, Susie stopped at QuikTrip on the way home and got me a couple bottles of Sprite Zero. And before we arrived home, the pharmacy had texted that my pain medication was ready for pickup. I had a lunch of chicken noodle soup and saltines crackers first, in case the pain medicine might upset my stomach. But I never experienced any negative side-effects from the pills either. The only effect of note was that I had to make many bathroom trips (some as close together as 10 minutes). These trips began before I’d consumed a lot of liquids. So, they must have pumped a lot of fluids into me via the IV during the surgery. I’d been instructed to “drink plenty of liquids” to prevent blood clots (as well as taking baby aspirin twice a day). That’s not a problem since on a normal day I drink from 100 ounces to over a gallon daily. Because of the frequent trips and the fear that I’d not get any sleep (and the difficulty each trip entails), I limited myself to 72 ounces. The next day wasn’t nearly as bad, despite drinking even more. I tried to take a nap and leverage the nerve block, but I was too alert. Plus, the regimen of hourly icings and exercises wasn’t conducive either. Of course the only exercises I could do with my right leg were leg lifts since nothing below the knee would respond to brain commands. While resting with my leg propped on a couple of pillows, I took inventory of my post-surgery state. My skin color was noticeably paler than normal. My throat was raw, no doubt from the breathing tube. And while I was unconscious, it looks like my tongue had been pushed aside by the breathing tube so that it was between my teeth. The left side of my tongue was deeply bruised and even had blood blisters where I’d “bitten” down on it. I’d been a bit wobbly a couple of times coming into the house and getting up the stairs to my second-floor “man cave.” My wife was certain that each stumble or wobble was going to be a fall. By mid-afternoon my “loopy” mental state was much improved and so I switched from the crutches to the iWalk to get up and move around a bit. The iWalk is so much better since it leaves your hands free. I did, however, need to customize the iWalk for my brace boot. There is a big red bulb at the top of the boot, on the shin, that is used to inflate the stabilizing bladders. Next to the bulb is another protruding button to deflate the bladders. When I was proactively practicing and sizing the iWalk (a necessary and highly recommended approach), I discovered that using the iWalk would deflate the boot and also quickly created a painful pressure point on the shin. The trick I used to resolve the issue was to buy some ultra-dense foam. I first cut the foam to fit into the iWalk on the “shin” platform. I then mounted the iWalk with the boot in place. The boot’s protrusions made imprints on the foam. So, before the foam reformed, I used a pencil to mark those pressure points. I then added about an inch margin to that area to allow for shifting. I then cut out the marked area and tested it again with the boot. The foam was about an inch thick and I thought I might need to double-up to get enough clearance, but it turned out that one layer was needed. I’d visited hardware, craft, and sewing stores on a hunt for foam that had a really high density. Ordinary foam, even some labeled high-density, would not take the weight required and deformed too easily. What I ended up using was a kneeling pad used by gardeners. 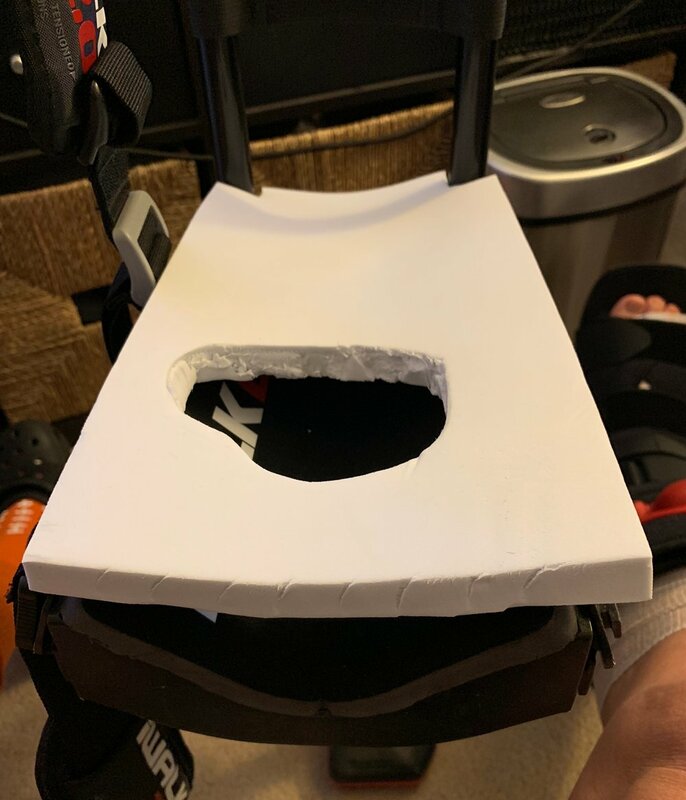 I cut out squares at both corners so the pad fit between the upright thigh supports of the iWalk. The pad turned to be the perfect width and matched the leg platform perfectly. Then it was just a matter of cutting off the extra length. I used my tweaked iWalk to get ready for bed, such as moving my CPAP machine from the office to bedroom, brushing my teeth, and tidying up the area around my office recliner (where I’d spent most of the day). I woke right at 6:00 AM, having slept through the night without any bathroom trips, which was actually unusual (I typically make 2 to 6 trips). The sleep was “normal” by personal standards. And sleeping with the boot elevated on pillows wasn’t an issue, much to my surprise. Although it didn’t wake me, the pain block had significantly worn off, and the first hint of ache in my heel could be felt. And I was finally able to wiggle my toes on command. Before getting out of bed I took the prescribed two Tramadol for pain and a baby aspirin for clot prevention. Within an hour the ache had grown beyond a hint and began the day’s icing regimen. I’m too fidgety to just sit or lay with an elevated foot while there’s nothing to do but think about the ache. So as soon as the ice session finished, I put on my iWalk and did some chores: wash my CPAP mask, shaved & shampooed, took a sponge bath, put on a change of clothes, etc. I took that opportunity to weigh with and without my “accessories” and the difference was 11.8 pounds. The ache increased gradually throughout the day but didn’t prevent me from getting up and doing simple chores like loading the dishwasher with my lunch dishes. The foot became more sensitive to touch and I took more care when donning or doffing my boot. The flaps that covered the top of my foot would no longer meet, indicating significant swelling. That was expected, normal, and a natural consequence of activity. So I did spend a bit more time with the foot elevated. The ankle rotations (one of the physical therapy exercises to done five times each day) were a real and painful challenge by nightfall. The others (supine straight leg lifts, toe crunches, heel sweeps, and quadricep sets) weren’t hard. It did however add to the busy and non-intuitive schedule, so Susie had me make a chart to help us keep everything straight. And it was handy to ask Siri to set timers. Although, my iPad’s Siri kept answering whenever I’d holler to get Susie’s attention downstairs. So I switched to sending texts, which also allowed Susie to venture outside and enjoy the sunshine with visiting grand babies. Getting up and down with only one weight-bearing foot puts unexpected strains on unused muscles and tendons. I’m glad that I’d been exercising daily for many months as this gave me upper and lower body strength and balance skills where needed. But I did feel strain on the inner thigh of my wounded leg. I also felt something akin to a stone bruise on my good foot since you do a lot of hopping, so I made sure to wear a shoe when up. And I caught myself stooping when using the iWalk, which was causing some back pain, but it was easily corrected when I realized I was overcompensating for the iWalk. Of course sitting in a recliner for long periods and propping the leg up caused pain points at the knees and back, but the discomfort was minor. Ow! Sleep was a real challenge Tuesday night as the ache flared in intensity. Most uncomfortable would be the times when the muscles in my foot would “clench” and that hurt. At the 2 AM mark I switched to the maximum dosage/frequency on my pain meds. That helped tremendously and to compensate for the loss of sleep I went back to bed after my 6AM dose and managed to get another two hours of sleep. Getting up and getting ready, is of course, slower. I had no deadline, however, and was bathed, shaved, dressed and ready to go in a couple of hours. That also included hand-washing my compression sleeves, cleaning my CPAP mask and tubing, and general tidying. Being up and active greatly diminished the ache, and allowed me to switch back to the lowest dosage/frequency level on my pain meds (1 every 6 hours). The more I use the iWalk the more efficient I become and I didn’t need to swap to the crutches at all. It was a sunny day, so I rode with my wife to run an errand at a store and we had lunch at our favorite burger joint before heading back home. I was pretty tired by that time and tried to take a nap. But, like the night before, when laying still, the ache seems to amplify and I had trouble sleeping. That night sleep came easier as I was sure to take a max dose before bedtime. On the downside, my AHI skyrocketed: nearly triple a “normal” night. This is a known issue with anesthesia and pain meds, so it’s a good thing I’m faithfully using the CPAP. Pretty much the same as yesterday with more spans of little to no pain. Getting up and out of the house is part of that and an upside of activity. The downside is activity promotes swelling and my foot is still too big for the toe flaps on my boot to even meet, let alone overlap (like they did before swelling). There’s no pain associated with this swelling, and I’ve continued to ice it after a stretch of activity. But being on-the-go makes icing every hour impractical. I can do about two or three hours before wanting a rest from the iWalk. And this isn’t constant activity either, as I take the iWalk off while driving (riding, that is) between destinations. The bumps in the road can be felt in my foot, but it’s only slightly uncomfortable (no stabbing pains) when on a rough patch of road. The previous night wasn’t a great one, but not the worst. Today the pain doesn’t even justify wasting the strong stuff, and a couple of Naproxen Sodium was sufficient for the rest of the day. I spent several hours in the vehicle, but made a stop about every hour, during a round-trip from Atlanta to Chattanooga to have lunch with a friend. I also received a call from another friend who was coming through Atlanta and wondered if I wanted company. We got back in plenty of time to meet him for a late dinner at a local BBQ joint. After that, back at the house, we sat and talked until about midnight. With all the activity the day before I slept really well and without any nighttime trips. Since my foot was doing so well, I didn’t take any pain meds of any kind today. My friend and I made one shopping trip that lasted until lunch. Then we came back to the house after eating at a local establishment. We got back mid-afternoon to meet his wife before they headed back to Chattanooga. The boot and iWalk weigh about 18 pounds together, and all the exertion for getting up and down and balancing was tiring, so I took a nap. It was a very pain-free day, with the only discomfort coming from the swelling which increased in the late afternoon. It was more pronounced that usual and I could feel the tightness of skin on my foot. The real indicator of swelling were the boot flaps that secure over the top of the foot. Normally, they overlap. With swelling, they barely or didn’t even meet. But today, there was a large gap of over two inches. The flaps are overlapped by Velcro straps, and one of those could not even be closed, the swelling was so pronounced. So I iced it a few times that evening. Even with the foot propped up, the weight of the boot is tiresome and makes my leg a bit sore from it’s constant influence. Another trip to Chattanooga and back. The weight of the boot was a real drag today. A fitful night of sleep didn’t improve matters. Getting my foot elevated was a challenge as the recliners at my destination had short leg supports. They supported very little of the boot weight and put the pivot and pressure point of the boot’s weight mid-calf. I eventually found a way to prop up my foot that supported the boot and applied ice. Even though there was a lot less walking, it was a very tiring day and I didn’t have much energy until the second half of the return trip that evening.